Peterborough Sports acadamey manager Marc Burchett (left) and chairman Stephen Cooper. Ambitious Peterborough Sports are to create an academy to help fulfil their dream of step three football. Sports, the runaway leaders of the step 5 United Counties Premier Division, are hosting a trial match for students, who will leave secondary education in the summer (and will be 16 for the launch of the ccademy in August), on February 4 at PSL (10.30am). Peterborough Sports first team manager Jimmy Dean. It’s the next step in chairman Stephen ‘Tommy’ Cooper’s masterplan to make his club, Peterborough’s outstanding second club. He’s already overseen three promotions in his six seasons at the helm, and Sports recently secured a 40-year lease on their gound which gives them great control over their destiny. Plans have been submitted with Peterborough City Council for a 2,000 spectator capacity facility which will include cover for 500 fans, work on which is hoped to be completed by the end of March to enable the Turbines (a homage to the club’s Brotherhoods connections) to take any promotion earned on the pitch. This would take Sports into the rarified air of either the Southern or Northern League depending on the geographical splits of clubs, and become the first side from the Peterborough area to play at that level in non-league since Posh themselves were in the Midland League (a league they left in 1960 to join the Football League). The current site at Lincoln Road would comfortably support another promotion beyond that and getting to Step 3 (Southern or Northern Premier) has long been stated as the club’s ambition without the need for additional major development, including access to and from the ground. Floodlit action from a Peterborough Sports match at PSL. Chairman Cooper recognises that, having now seemingly overcome the off field obstacles to progression, there remain real challenges to stepping up again and continuing the success. 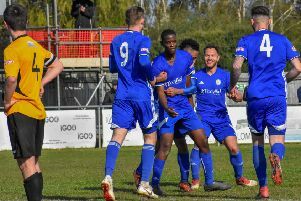 He said: “We are a relatively new club in the non-league world, and as such have had to begin establishing our own fan base from scratch and it will take time for people to start coming to support us on a regular basis. “If we go up, we immediately lose all of our local derbies and our average distance to other clubs moves from 33 miles to 83 miles putting pressure on finances. Marc Burchett, who already looks after the highly successful Regional Talent Centre at the ground, will head up the academy. He said: “Peterborough Sports is a highly progressive and successful club and the forward momentum created by everyone involved can only be enhanced by launching what we plan to make the area’s premier footballing academy within two years. Current first team boss Jimmy Dean added: “Developing our own players will be key to our continued success. Jordan MacLeod came through the youth system at PSL into the current first team and a number of others such as Jack Barron have also featured having come up via that route. Potential students and anyone wanting to take part in the trial game should contact Burchett on 07850 002082 or by e-mail peterboroughsportsacademy@gmail.com. Successful students would be expected to study for half-a-day, three days a week (14 hours in total) and train for the other half of the day, while also playing matches against other acadamies. The students would study for a BTEC which counts as university entry qualification. The scheme would be part-funded by government grants.